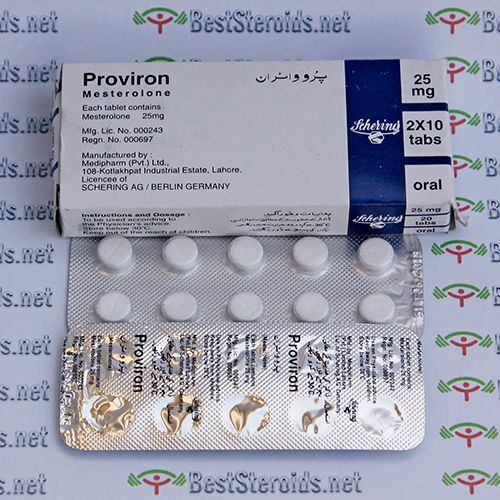 Proviron (mesterolone) is a synthetic androgenic steroid and oral antiestrogen. Proviron is an estrogen antagonist that prevents the aromatization of steroids. Proviron restore sexual disfunctions caused by steroid cycling. It will help get rid of the lack of sexual desire that most bodybuilders experience during a long steroid cycle. It also will help with the decreased sperm count and quality that steroids exhibit on the body. It does not however increase testosterone production in the body. It is also used as an anti-estrogen as well. Proviron provides a dual blocking scheme in that it prevents the aromitization of steroids as well as competes with estrogen to block the receptors as well. It block gyno and the increased water retention that steroids give the user. Proviron allow increased muscle hardness since the estrogen levels will be low. It is commonly taken with HCG or Clomid. It is a popular precontest drug to increase muscle hardness. Effective dose seems to be 50 -100 mgs per day by taking one to two 25 mg tablets in the morning and one to two 25 mg tablets in the evening. Used while on cycle and off 40 mg daily. Not too powerful substance by any means but does support on cycle very well and keept everything in balance. I used this and HCG on and off cycle. Pharma grade and pharma made. Worked perfectly. It did what is was designed to do! I have just ordered more.